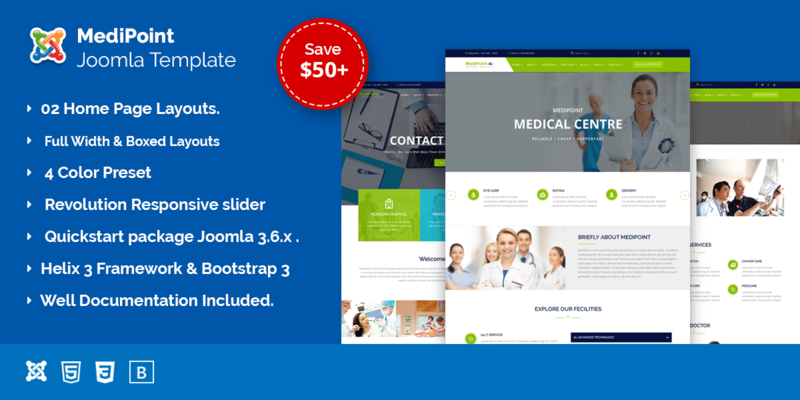 Medipoint Joomla Template One of the Clean and well Documented Joomla Responsive Template for Hospital, Clinic, Medical Center. It has 2 home page combination with 4 different color variations. Mega Menu Builder & Offcanvas Menu Ready. Premium Extensions included ? $52 saved. Helix 3 Framework, Bootstrap 3 and LESS CSS Ready. 15+ hrs Real Time Custom Support in a day. Use Google font Raleway and OpenSans.